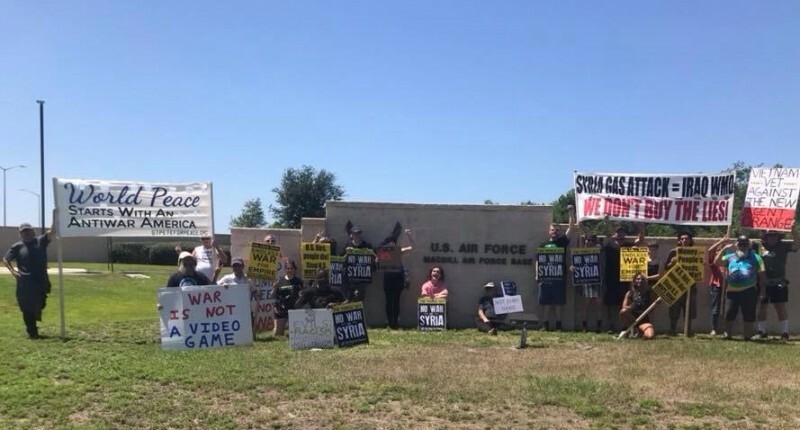 Tampa rally against war on Syria held outside military base | Fight Back! The protest rejected any act of aggression against Syria. Emboldened by the quickly diminishing credibility of American corporate media, the event sought to challenge the imperialist narrative on Syria which claims that President Bashar Al-Assad used chemical warfare against a civilian population in Douma a week and a half ago. Among the various groups in attendance, members of Freedom Road Socialist Organization were present. Bill Aiman, of FRSO, said, “I came out to the protest because it is crucial that all peace-loving people oppose U.S. imperial aggression and support all nations in their fight against U.S. imperialism.” The event featured other activists who asserted that the U.S. should prioritize the funding of public education over the bombing of foreign countries. As American influence on the global stage continues to nosedive, events such as these are help others see through the lies of the warmongers.